This past month, while we were staying with my parents in South Dakota for a few days, Mom made my sister’s famous monster cookies. As I was looking at the recipe on the kitchen counter that morning, I found myself trying to figure out if those awesome cookies could actually pass off as breakfast. I decided that surely one would be alright. ;) But I made a promise to myself to play around with this recipe once we got home, to come up with a cookie that I could feel better about serving to our girls for breakfast or packing into their school lunch bag. My experimenting resulted in these Banana Peanut Butter Breakfast Cookies with Whole Wheat, Oats, and Dried Blueberries. They’re hearty and delicious, and were the perfect send-off for the girls’ first day of school yesterday. 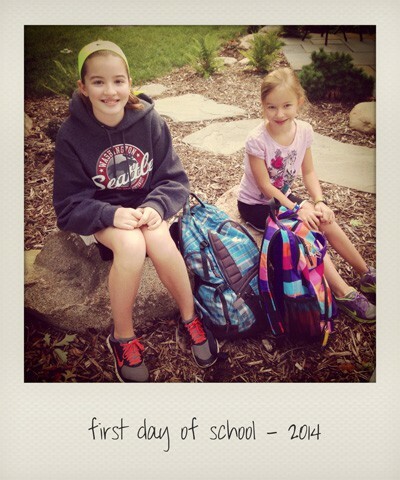 Our daughters were excited, with a big side of nervousness, as they ventured off to 7th and 2nd grade yesterday. The whole new experience of Hatti starting junior high has amplified the start of this school year for our entire family, but we prepared as best we could, said a few extra prayers, and sent Hatti off. She was ready for the change and the challenge. All she needs now is some time to get used to her new surroundings and schedule, and she’ll be awesome as ever. Tessa’s first day in 2nd grade was uneventful. Which is good. She was excited to have the same teacher as Hatti had in 2nd grade, as Hatti (and Mom and Dad) has always talked so highly of her. When we picked Tessa up from school, she was all smiles, happy to show us worksheets she had finished that day and to tell us about her new classroom. I realized something from my own motherhood perspective on yesterday, too. I didn’t cry. This was the first year EVER that I didn’t get at least a little blurry eyed watching our girls walk away from me, toward their new school year. When I first realized this late yesterday afternoon, I questioned if I was feeling alright, if I wasn’t quite myself. But then I laughed out loud, knowing with all confidence that I just felt that much more secure about what we were all headed into. I’m certain we’ll have our issues along the way, but also know that whatever gets thrown at us, we’ll find a way to deal with it. Together. 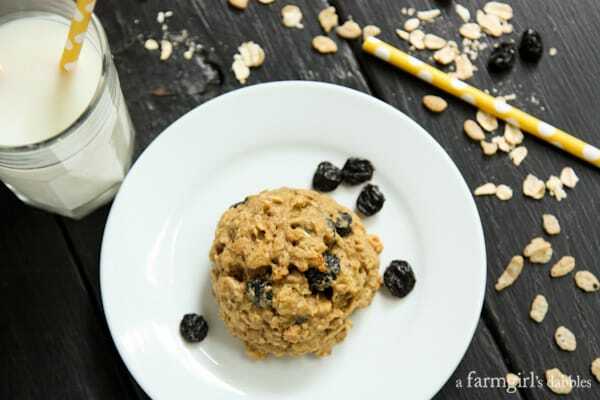 These breakfast cookies incorporate so many of the good things that I turn to for energy and nutrients at the start of the day. Bananas. Peanut butter. Oats. Dried fruit. While it’s true that my sister’s monster cookie recipe was the inspiration for these breakfast treats, it should be very obvious that these cookies are considerably healthier. 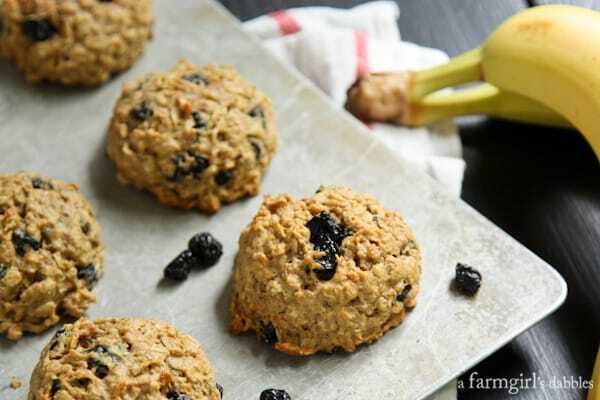 They are much like a whole wheat banana muffin, in a fun cookie form. 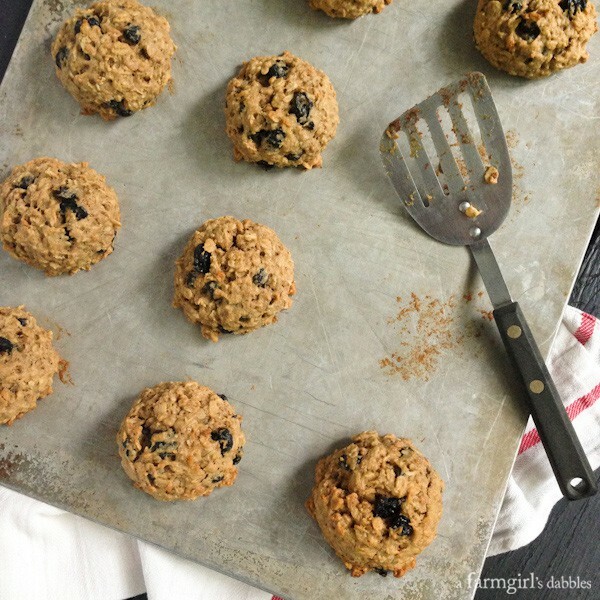 Soft and hearty and full of the fabulous flavor combo of peanut butter and bananas, these cookies contain much less sugar, dried blueberries in lieu of M&M’s and chocolate chips, and white whole wheat flour. 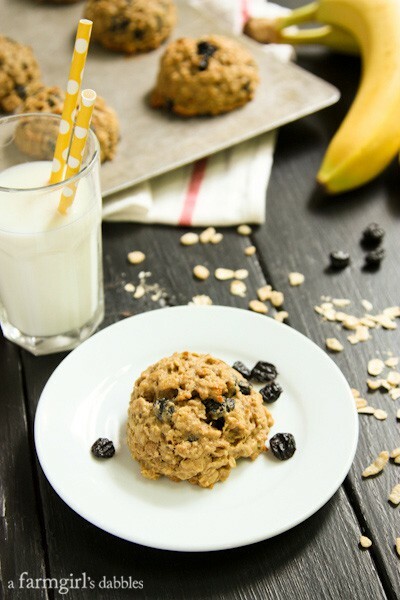 Our girls have fallen in love with these banana and peanut butter breakfast cookies. With a side of fresh fruit, it’s an awesome way to get a jump start on the day. 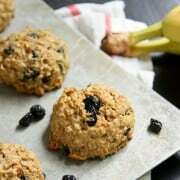 These breakfast cookies are best when eaten freshly baked, when the exteriors have a thin crispiness to them. But our girls also love the cookies the next day after a few seconds in the microwave to warm them up, when the exterior texture is softer. These cookies freeze beautifully, both before and after you bake them. So if you like that just-baked texture best of all, simply freeze the dough in its scooped-up cookie form, and then bake it up fresh whenever you like, adding a minute or two of extra baking time. In the bowl of a stand mixer, combine butter and peanut butter. Beat on medium speed until just incorporated. Add brown sugar and honey, and beat until mixed together. Add bananas, eggs, and vanilla. Beat well. Then add whole wheat flour, baking soda, cinnamon, and salt, and beat until just combined. With a spatula, fold in the oats, rice cereal, and dried blueberries. Using a large cookie scoop (or about 3 tablespoons), drop mounds of dough onto ungreased cookie sheets. These cookies hardly spread, so you can place the dough mounds pretty close together on the cookie sheets if you like. Bake for 15 to 16 minutes, until cookies are set and lightly browned. Let cookies cool on cookie sheet for 1 minute before transferring to a wire rack to cool completely. These cookies are best when eaten freshly baked, when the exteriors have a thin crispiness to them. But they are also good the next day after a few seconds in the microwave to warm them up, when the exterior texture is softer. These cookies freeze beautifully, both before and after you bake them. So if you like that just-baked texture best of all, simply freeze the dough in its scooped-up cookie form, and then bake it up fresh whenever you like, adding a minute or two of extra baking time. From a farmgirl’s dabbles, inspired by my sister’s monster cookies recipe.